Convamore was the home of wealthy glove manufacturer Henry Bryant Phelps in Back Kingston, today's Higher Kingston. Henry married in the spring of 1838 in Yeovil and by the time of the 1841 census Henry and his new wife Mary were living in Convamore. Henry was aged 25, Mary was aged 20 and their baby son Henry was aged one. Henry listed his occupation as a glove manufacturer and their house, Convamore, was attached to his glove factory in which he employed 90 men, as seen in the map below. Henry had the house built in the Regency style, of two storeys under a Welsh slate roof with typical wide eaves of the style. It had a projecting wing at the front with a round-headed doorway with fanlight (converted to a window in the photograph below) at the front and a grander entrance with a stone Ionic porch to the side. Henry retired in the late 1850s or early 1860s and his glove manufactory was taken over by his brother Robert's company, Robert Phelps & Co. However Henry and Mary stayed in the house; living there for some fifty years - he died in 1888 and she in 1893. Whitby's Yeovil Almanack Advertiser of 1903 noted that Convamore was the home of Alfred Herbert Allen and his wife Juliana. By 1907 Juliana, now a widow, was listed living there in Collins' Directory. In Kelly's Directory of 1919 Edward Carlyle McMullen was listed as resident and Dr Arthur Norman Haig was listed in Kelly's Directory of 1935. Dr John Edwin Morley and his wife Grace were resident from about1937 until !947. Dr Morley was Dr Haig’s junior partner until Dr Haig retired and the Morley family were the last residents before Convamore became part of Yeovil Hospital’s administrative block. In both Snell's Directory of 1954 and Foord's Directory of 1964 Convamore was listed as the Group Offices of the South Somerset Hospital Management Committee. 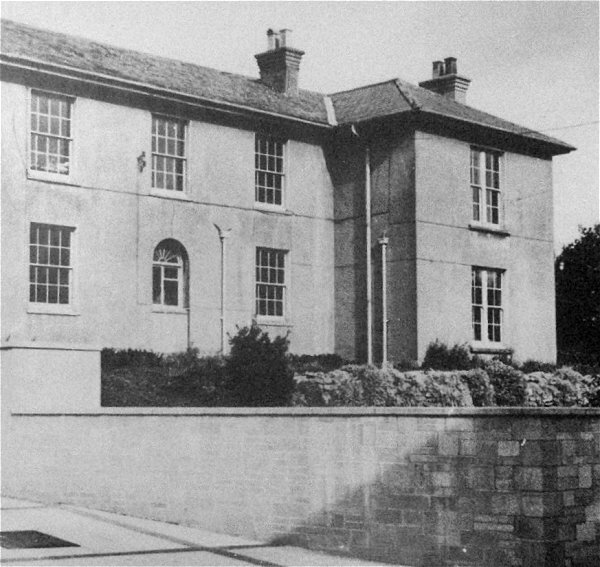 Convamore was finally demolished in 1969 although the name lived on in one of the accommodation blocks for the hospital's resident staff. 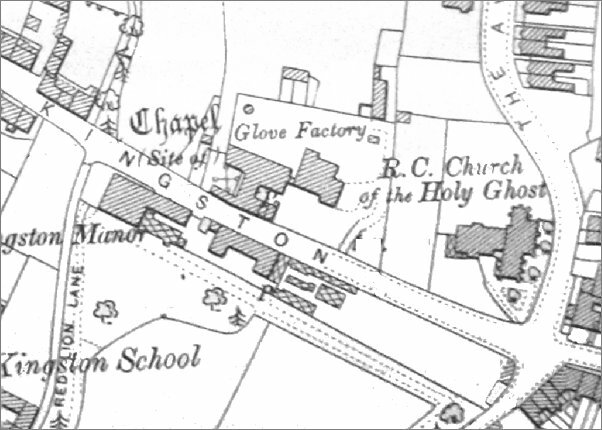 This map, based on the 1901 Ordnance Survey, shows Henry Phelps' glove factory with his house Convamore to its side. After Henry retired, the factory was taken over by his brother, Robert, although Henry remained living at the house until his death in 1888. Convamore, the house in Back Kingston that Henry Phelps had built. It was demolished in 1969. 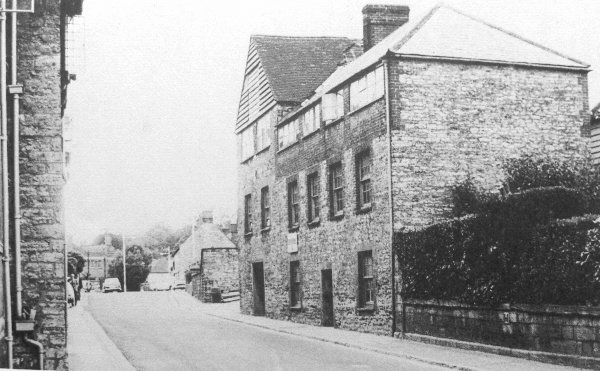 This photograph of about 1965 shows Henry Bryant Phelps' glove factory in Back Kingston (today's Higher Kingston). It stood on the north side of the road opposite Kingston Manor House. The hedge and wall seen at right was the garden wall of Henry's house, Convamore, which was set back from the road. Phelps and his family continued to live in the house but the glove manufactory was taken over by his brother's company, Robert Phelps & Co, in the 1860s. By 1903 it had been taken over by Hawkins, Jesty & Ricketts.